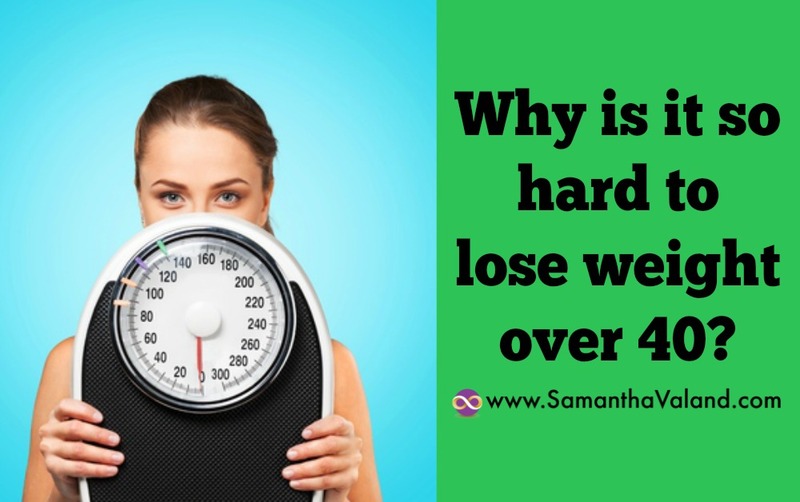 Why is it so hard to lose weight over 40? Once upon a time, you were able to skip lunch for a few days and easily fit into your Friday night dress. Why is it so hard now? Well, a lot has probably changed since then. You may have more responsibilities now. If you think back then, it was probably quite a carefree time. Fast-forward 20 years, your job responsibilities will have increased; perhaps you run your own business. Family responsibilities may have changed, perhaps you have your own children or looking after your parents? Maybe squeezed in the middle with both? Personally, you may have had an illness, or injury. If you have given birth, it can have a massive impact on your body. With increasing responsibilities and time pressures, we often do not look after ourselves very well. 20 years ago, you may have been a well-oiled machine, but if you have not been changing the oil regularly and looking after the tires, you might be finding a bit of struggle now to maintain your shape. What did you used to do when you had a bad day at the office? Again, I think this is an area that changed and having a wee glass of wine because ‘you deserve it’ is very common these days. I think the way we eat now, is vastly different to 20 years ago. You would only have eaten out on special occasions. Lunch at work was mostly brought in from home or from the staff canteen. A healthy snack would be a piece of fruit. Nowadays, I know many people eat two out of their three meals outside their home. Unless it is a big chain, you are unlikely to know how many calories are in each meal, and while it may look healthy, we are easily loosing track of how many calories we are taking in. Back in the day if you asked for a coffee, you would be asked if you want milk and sugar with it. Nowadays the coffee options are endless, and then of course asked if we want a muffin to go with that. We are being asked to make so many more decisions on a daily basis, it can be exhausting. Decision fatigue is a real thing. You may feel you make good food choices throughout the day but in the evening really struggle and say yes to things you wish you had said no to. Then we add the menopause into the mix. In the UK, you are considered post-menopausal when you have 12 consecutive months without a period. The average age is 51. Unfortunately, our hormones don’t act like an on/off switch and it can be many years beforehand that our hormones levels can start changing causing an increase in PMS and menopausal symptoms. We are used to hearing about the really unpleasant symptoms such as hot flushes. But for many, symptoms can be a wee bit more mundane, and these can be the ones that affect how we eat. Energy levels can plummet and sleep is more easily disturbed. Both can change how you eat. If you are tired you will naturally eat more but also be less active. Which is inconvenient occasionally but if it happens over a period time you will put on weight, eat less and exercise more in reverse! Two hormones that are affected by the menopause are cortisol and insulin. Cortisol is a stress hormones. Excess cortisol is stored around your abdomen. You may not feel that your life is stressful, particularly if nothing has changed recently but it’s all happening internally. How does your body show you it’s stressed? Tight shoulders or perhaps a sensitive digestive systems. Most of us know our stress cues but don’t often listen and just bash on. Most people know about insulin through diabetes. You can become sensitive to insulin through the menopause which means your tolerance to carbs may change . – you can read blog on Carbs and the Menopause here. Again the feeling that nothing externally has changed, you are eating the same foods but internally you not giving your body what it needs. Too much carbs for you personally means you will probably put on weight, too little may affect your sleep. It’s a fine line of experimenting and the GI diet is a good place to start to get an idea of how quickly foods are absorbed. I can count on one hand the number of women who feel skipping meals or fasting works for them as they get older. It can exasperate hormones and lead to cravings and binging for many. The menopause is not the only reason you may have trouble losing weight. If you gut is telling you something is else off, please go to your doctor and be persistent if they fob you off. I am off the school of thought that ‘abs are created in the kitchen ‘. Exercise is for health benefits rather than the amount of calories a session burns. However, I know exercise helps people with motivation, as in if you are just back from the gym, you are likely to have a different thought process on eating. Eating to fuel your body. One of the ways we can put on weight is because our muscle mass decreases as we get older if we do nothing about it. Weight training is the best way to increase muscle mass- please don’t roll your eyes here! I follow The Rock on Instagram, and spoiler alert, he doesn’t go to the gym twice a week and lift weights for 30 mins, he’s in every day. So you are not going to look like him by adding in weights to your exercises routine. Weight training helps you get your waistline back during the menopause due to the affect it has on your hormones, so it is worth considering. If your finances allow find yourself a personal trainer who is the same age as you or is used to training menopausal women. It isn’t covered in the standard personal training certificate so make sure it’s an area of interest to them. Can you spot reduce a particular area? Yes you can, but through balancing hormones not specific exercises. As I mentioned above, any excess weight just around your waistline is often an excess of cortisol. You can use exercises such as Hatha Yoga or leisurely walking to help reduce stress levels, which in turn will help reduce our waistlines. Sleep is the ultimate in hormone balance, sleeping more and making it a priority. A strong core is the foundation of any exercise programme. If this is where your energy levels are today then it is a great base to start from. There are many styles of Pilates and the instructor’s personality will be a big part of your enjoyment of the class. You may have to kiss a few frogs to find one that suits you. A good Pilates class will have you in many alignments, on your side, your tum, on hands and knees not just lying on your back, which is just an abs class. A strong core will help improve the tone of your waistline but it will not remove any excess weight from there. • I use food diaries as a food planner to start with and then going back to see if you have eaten differently and why. Not with any judgement, just with curiosity, which you can then make adjustments. You can read my blog on food diaries that explains that process and grab a free template to use. • Your exercise or activity routine may need a wee shake up. Did you get a sense reading the section on exercise what you wanted to start or stop? • Lifestyle changes can be hard to bring into everyday life. However, if you have ever seen the amount of sleep a teenager needs going through puberty, you can probably get an idea that perhaps you need more sleep going through the menopause! • Last but not least, a wee bit of gratitude for your body. There can be a lot of negative chitter chatter in your head about getting older. Being grateful for whatever shape we are in, helps us to look after ourselves a bit better. A comprehensive hub of resources on healthy eating and exercising in your menopausal years and beyond.